Today’s Flash Back Friday comes from Episode 107, originally published in September 2012. Governments and globalist elites infiltrate more and more of people’s lives worldwide every day, and according to Charles Upton’s studies, religions have both covertly and blatantly (under the guise of “helping”) been subjected to the same interference. Jason Hartman interviews author, Charles Upton, about his lifelong studies of comparative religion and metaphysics, and what has been happening and is continuing to happen within religious sectors, particularly the move toward one worldwide religion. Charles points out the three ways that he feels religions are being controlled, including developing false religions and belief systems, like UFOs and the Mayan Apocalypse. Charles Upton is a poet, social critic, and a lifelong student of traditional metaphysics and comparative religion, as well as a veteran of the counterculture of the 60’s and 70’s. He began his writing career as a poet; his short epic Panic Grass and his second book of poems were published in 1968. In the 80’s, he participated in the movement against U.S. intervention in Central America and the sanctuary movement for Central American refugees, and shortly afterward did a tour of duty, partly as a participant, partly an investigator, in the mass magical/populist peace movement of the New Age. Charles has written and had published 17 books, with several books on metaphysics, a topic he was introduced to through his wife, Jenny. He authored the book The System of the Antichrist: Truth and Falsehood in Postmodernism and the New Age in 2001. 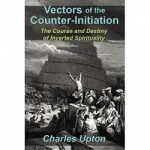 The sequel to that book is his newest book published in 2012, called Vectors of the Counter-Initiation: The Course and Destiny of Inverted Spirituality, which discusses the history, nature, methods and agendas of false spirituality, as seen in terms of culture, politics, metaphysics and paranormal, and includes the co-optation of both esoteric organizations and the world religions themselves. For the last quarter century, Charles has been a traveler on the Sufi path.